When we come across a truly exceptional product, it is selected to offer for audition. The Shanling above is one of these products. The Shanling CD-T2000 CD player is one of the best we have heard at its price point. Unbelievable value for money, excellent performance and fabulous aesthetics that make for an eyecatching piece of art in any room. 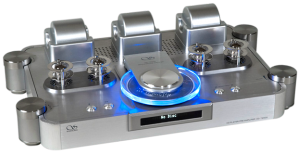 The predecessor (the legendary CD-T100) of this latest model had great reviews and the valves gave it an utterly exceptional midband presence with uncanny transparency. The new model retains this quality but has improved the bass to the point where the tonal balance is faultless. Music flows effortlessly and with a sense of naturalness and speed not found on solid state models (which have an electronic graininess when compared).